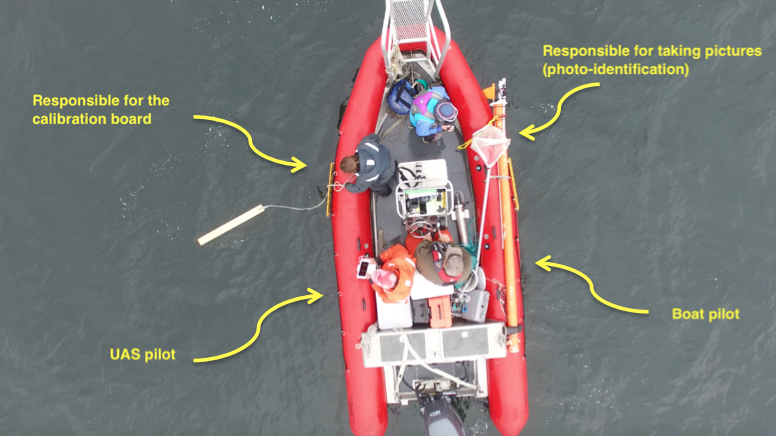 A couple weeks ago the GEMM Lab trialed something new in our gray whale research: the addition of a thermal imaging camera to our drone. For those who do not know what a thermal imaging camera is, it is a device that uses infrared radiation to form an object, and operates in wavelengths as long as 14,000 nm (14 µm). A thermal camera uses a similar procedure as a normal camera, but responds to infrared radiation rather than visible light. It is also known as an infrared or thermographic camera. All objects with a temperature above absolute zero emit infrared radiation, and thermography makes it possible to see with or without visible light. The amount of radiation emitted by an object intensifies with temperature, thus thermography allows for perception of temperature variations. Humans and other warm-blooded animals are easily detectable via infrared radiation, during the day or the night. Infrared radiation was first discovered in 1800, by the astronomer Frederick William Herschel. He discovered infrared light by using a prism and a thermometer (Fig.1). He called it the infrared spectrum “dark heat”, which falls between the visible and microwave bands on the electromagnetic spectrum (Hitch 2016). 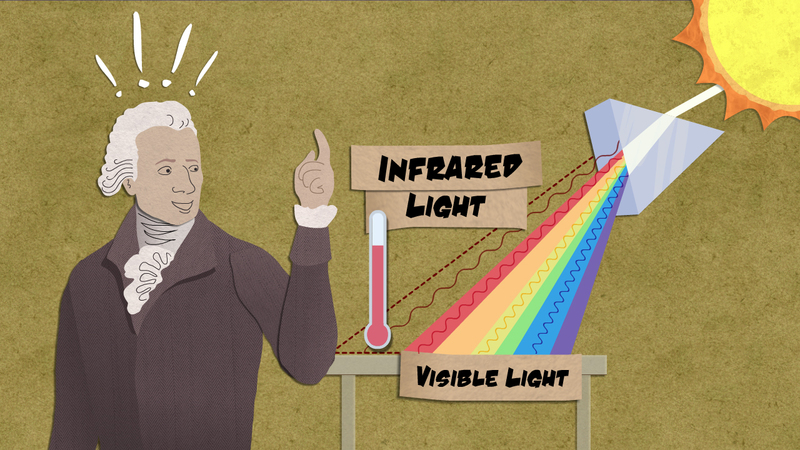 Figure 1: Astronomer Frederick William Herschel discovers infrared light by using a prism and a thermometer. Around 30 years later it was possible to detect a person using infrared radiation within ten meters distance, and around 50 years later it was possible to detect radiation from a cow at 400 meters distance, as technology became gradually more sensitive (Langley, 1880). Thermography nowadays is applied in research and development in a variety of different fields in industry (Vollmer and Möllmann 2017). Thermal imaging is currently applied in many applications, such as night vision, predictive maintenance, reducing energy costs of processes and buildings, building and roof inspection, moisture detection in walls and roofs, energy auditing, refrigerant leaks and detection of gas, law enforcement and anti-terrorism, medicinal and veterinary thermal imaging, astronomy, chemical imaging, pollution effluent detection, archaeology, paranormal investigation, and meteorology. Detection of the presence of icebergs, increasing safety for navigators. Figure 2: Thermography approved in 1982 to detect breast cancer. Method is able to detect 95% of early stages cancers. Figure 3: The use of thermal imaging cameras by the fire departments. In environmental research, the thermal imaging camera is an interesting tool used to detect wildlife presence (especially for nocturnal species), to monitor wildlife and detect disease (Fig.4), and to better understand thermal patterns in animals (Fig.5), among others. Figure 4: Wildlife monitoring: detection of mange infection in wolves of Yellowstone National Park. During winter, wolves infected with mange can suffer a substantial amount of heat loss compared to those without the disease, according to a study by the U.S. Geological Survey and its partners. Source: Wildlife Research News 2012; USGS 2016. 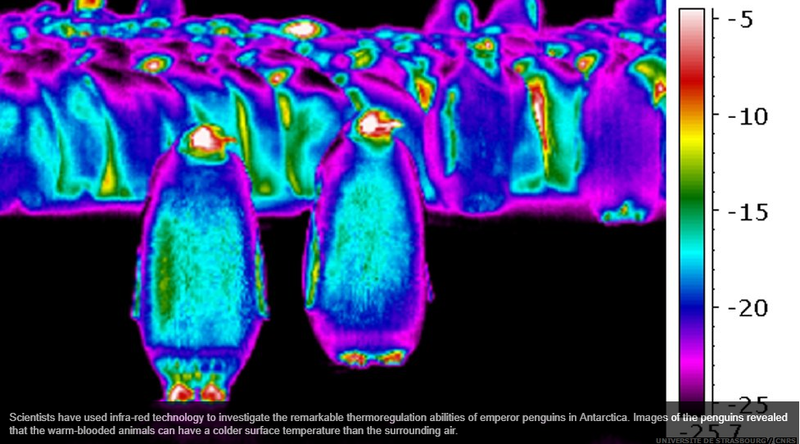 Figure 5: Study on thermal patterns and thermoregulation abilities of emperor penguins in Antarctica. 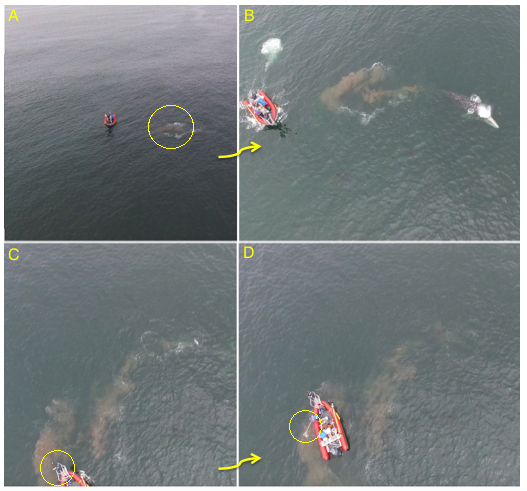 Now that thermal cameras are small enough for attachment to drones, we are eager to monitor whales with this device to potentially identify injuries and infections. 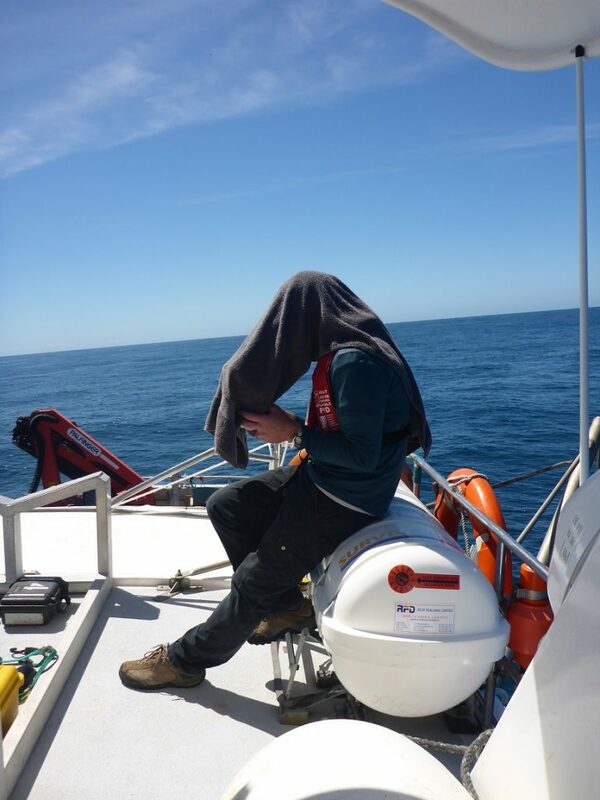 This non-invasive method could contribute another aspect to our on-going blue and gray whale health assessment work. 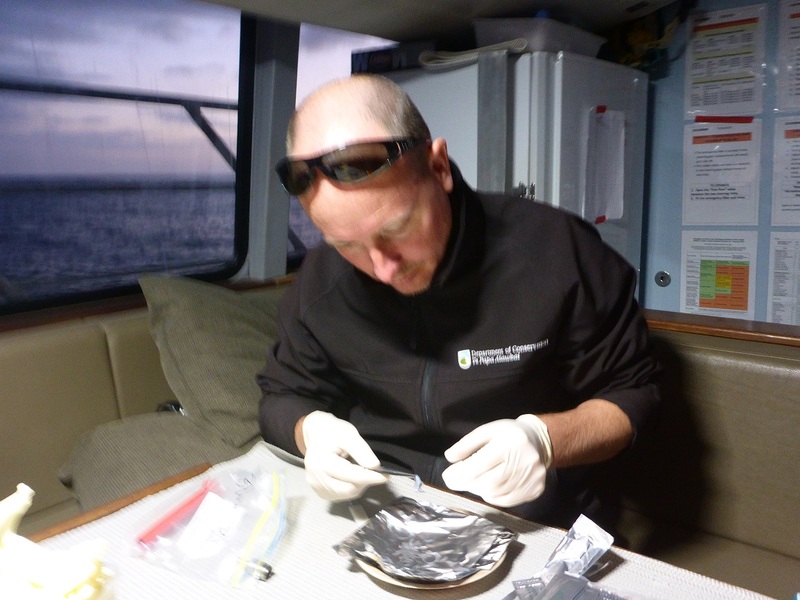 However, dealing with new technology is never easy and we are working to optimize settings to collect the data needed. Our test flights with the thermal camera were successful – we captured images and retrieved the expensive camera (always a good thing!) – but the whale images were less clear than desired. 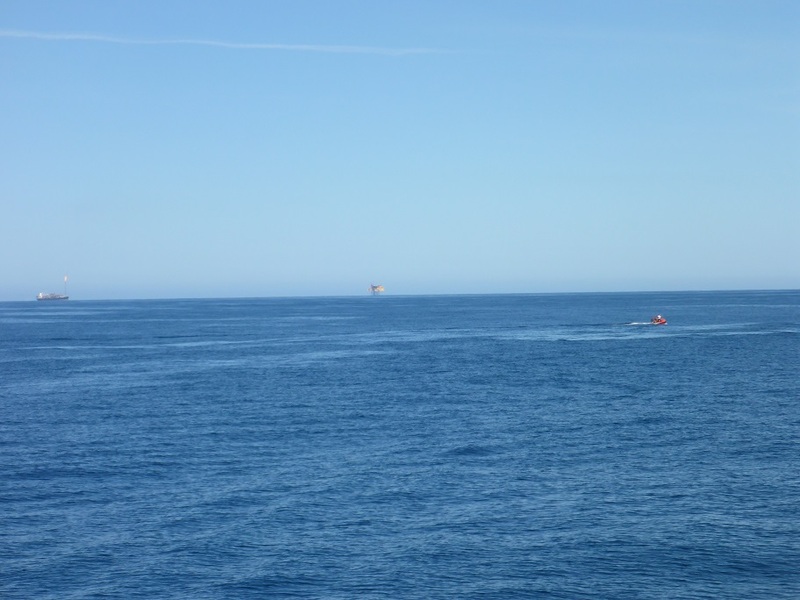 The camera was able to detect thermal variation between our research vessel and the ocean (Fig. 6: boat and people are displayed as hot coloration (yellow, orange and red tones), while the ocean exhibited a cold coloration (purple). 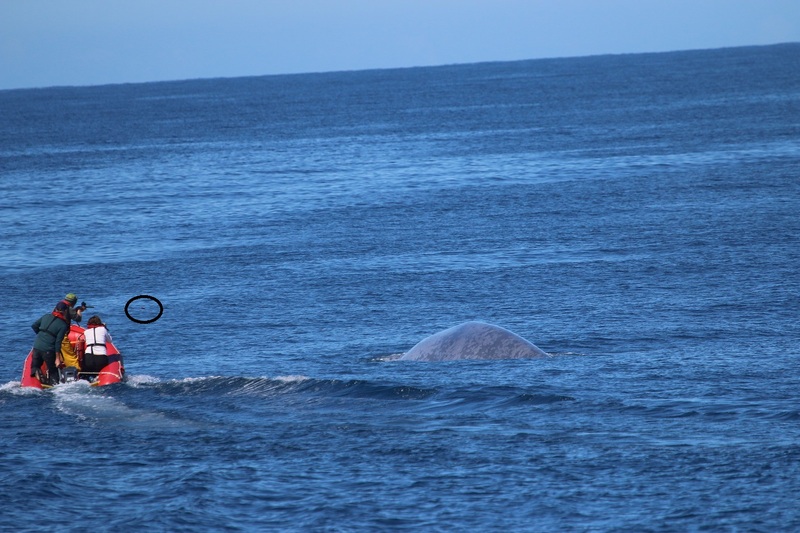 Yet, the camera’s ability to differentiate thermal content of the whale while surfacing from the ocean was less evident (Fig. 7). 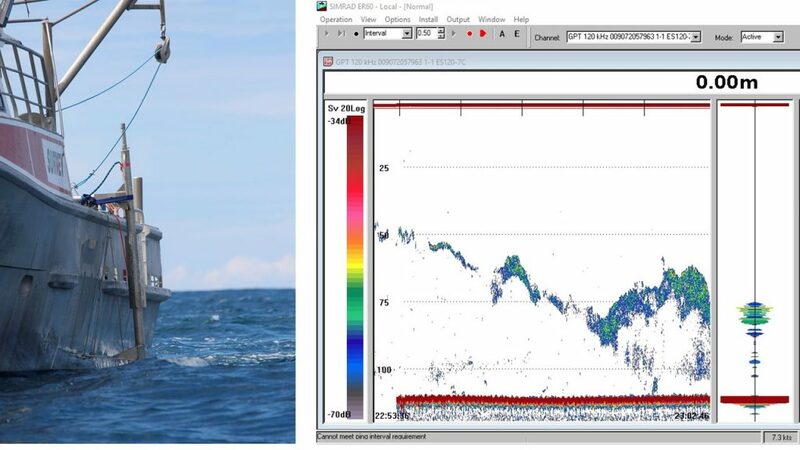 We believe this problem is due to automatic gain control settings by the camera that essentially continually shifts the baseline temperature in the image so that thermal contrast between the whale and ocean was not very strong, except for those hot blow holes shinning like devil eyes (Fig. 7). 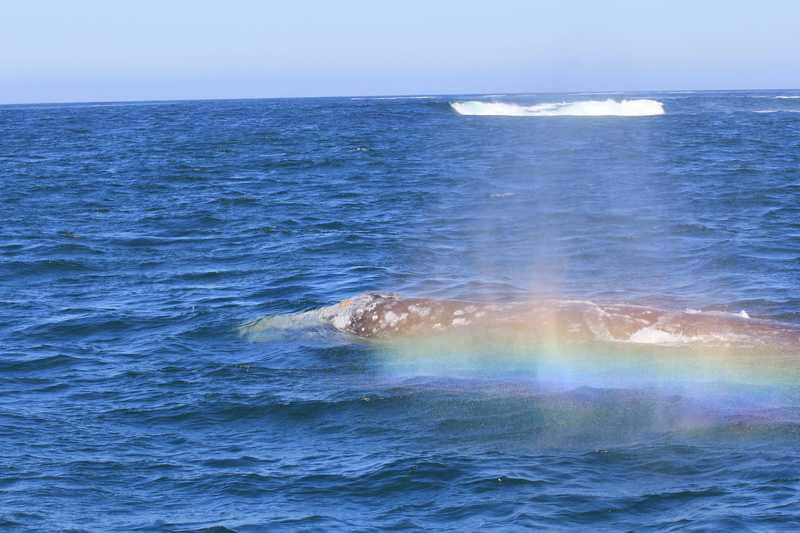 We are working to adjust these gain settings so that our next trial will be more successful, and next time we will see our whales in all their colorful thermal glory. 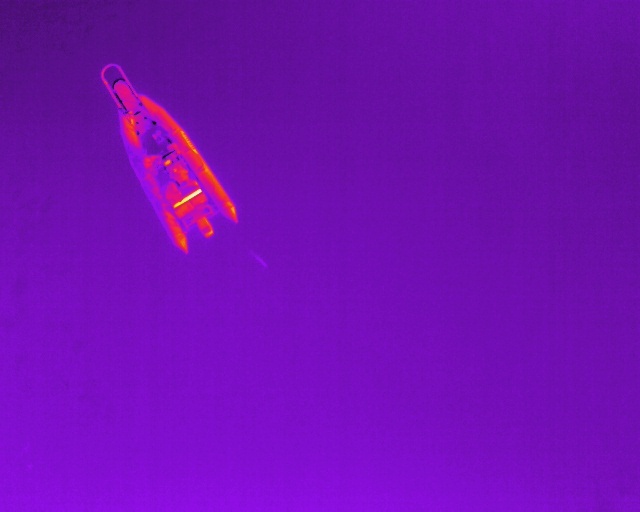 Figure 6: Thermal image of the R/V Ruby captured by a thermal camera flown on a drone by the GEMM Lab on September 09th, 2017. Figure 7. 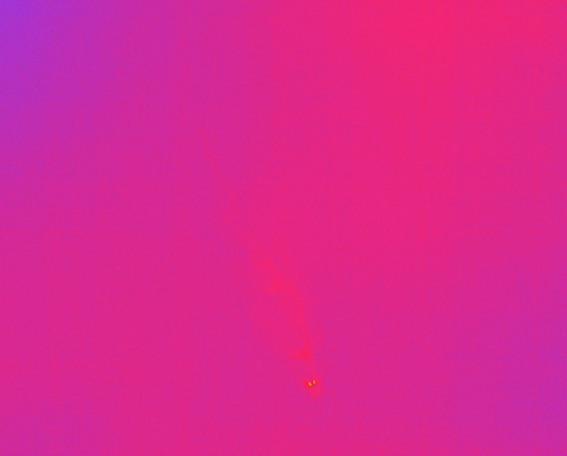 Thermal image of a gray whale captured by a thermal camera flown on a drone by the GEMM Lab on September 09th, 2017. Notice the ‘hot’ color (yellow-orange) of the blow holes indicating the heat within the whale’s body. (Image captured under NOAA/NMFS permit #16111). Langley SP. 1880. The bolometer. Vallegheny Observatory, The Society Gregory, New York, NY, USA. Vollmer M. and Möllmann KP. 2018. Infrared Thermal Imaging: Fundamentals, research and Applications. Second Edition. Wiley-VCH: Weinheim, Germany. New aerial footage captures blue whale lunge feeding! This past field season the New Zealand blue whale team was lucky enough to capture something spectacular – an aerial view of a blue whale surface lunge feeding. I invite you to view the footage and listen to Leigh’s narration of the event in the video below! 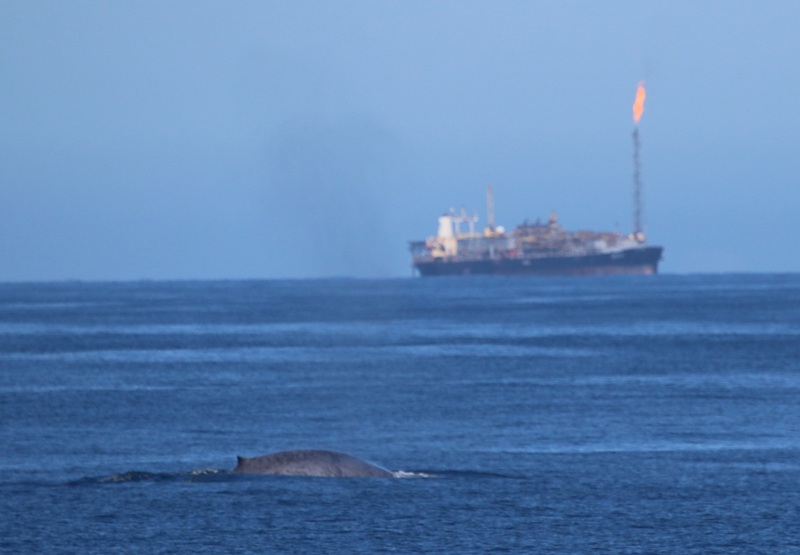 NEWPORT, Ore. – Blue whales didn’t become the largest animals ever to live on Earth by being dainty eaters and new video captured by scientists at Oregon State University shows just how they pick and choose their meals. There is a reason for their discretion, researchers say. The whales are so massive – sometimes growing to the length of three school buses – that they must carefully balance the energy gained through their food intake with the energetic costs of feeding. 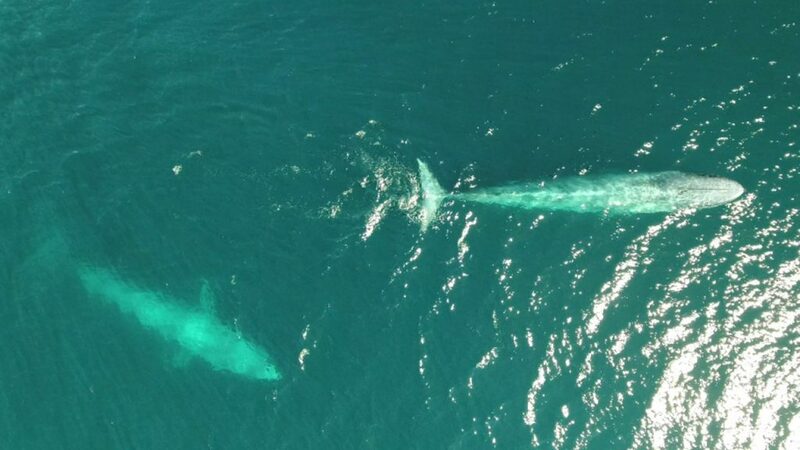 The video, captured in the Southern Ocean off New Zealand, shows a blue whale cruising toward a large mass of krill – roughly the size of the whale itself. The animal then turns on its side, orients toward the beginning of the krill swarm, and proceeds along its axis through the entire patch, devouring nearly the entire krill mass. In another vignette, the same whale approaches a smaller mass of krill, which lies more perpendicular to its approach, and blasts through it without feeding. 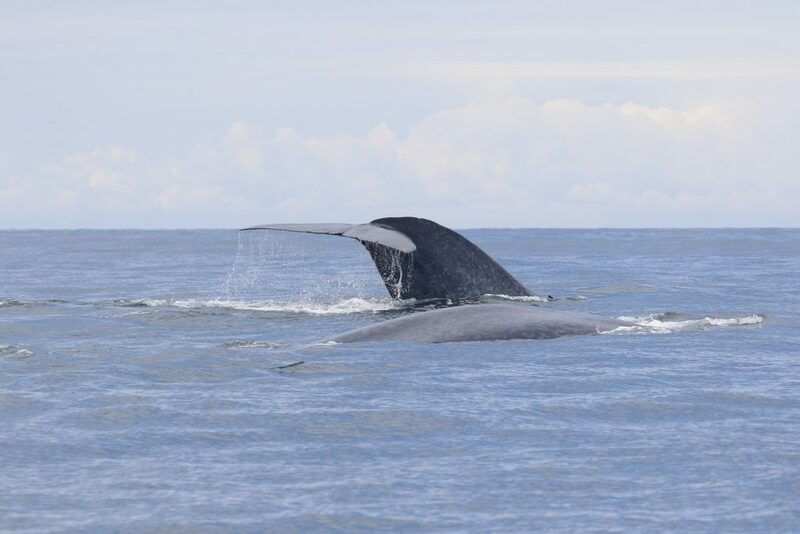 “We had theorized that blue whales make choices like this and the video makes it clear that they do use such a strategy,” explained Torres, who works out of Oregon State’s Hatfield Marine Science Center in Newport, Oregon. “It certainly appears that the whale determined that amount of krill to be gained, and the effort it would take to consume the meal wasn’t worth the effort of slowing down. 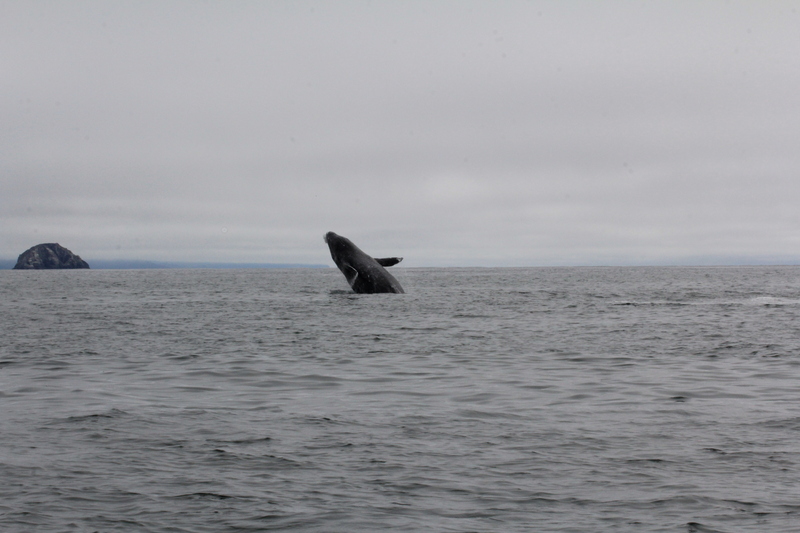 The researchers analyzed the whale’s lunge-feeding and found that it approached the krill patch at about 6.7 miles per hour. The act of opening its enormous mouth to feed slowed the whale down to 1.1 mph – and getting that big body back up to cruising speed again requires a lot of energy. 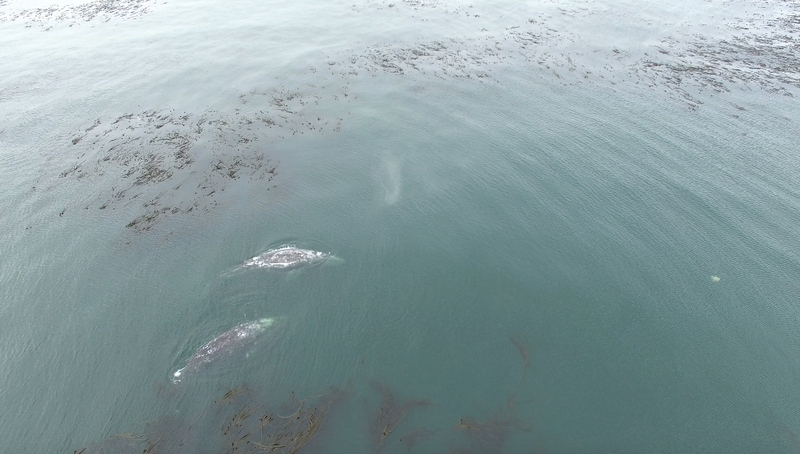 The rare footage was possible through the use of small drones. 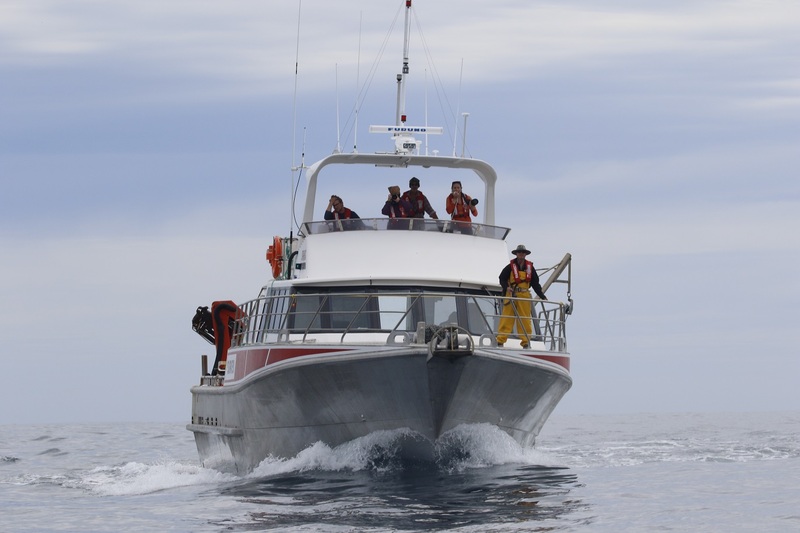 The OSU team is trained to fly them over whales and was able to view blue whales from a unique perspective. 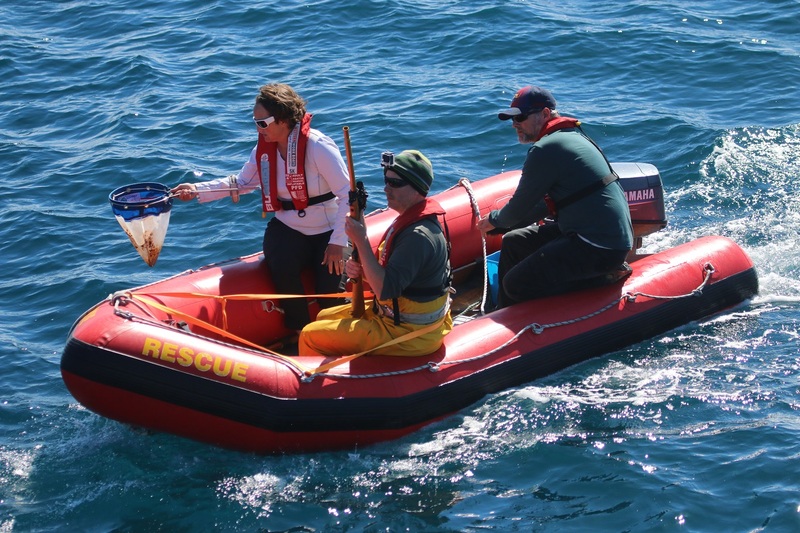 Posted on April 18, 2017 April 19, 2017 Author Dawn BarlowCategories New Zealand blue whalesTags blue whale, Dawn Barlow, drone, Field Work, foraging ecology, GEMM Lab, Leigh Torres, New Zealand1 Comment on New aerial footage captures blue whale lunge feeding!